What is a Kinetic Sculpture Vehicle? 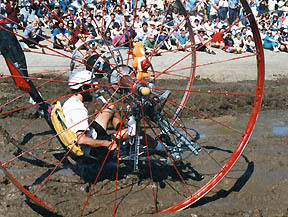 It is a human-powered, all-terrain vehicle that can double as a parade float. All-terrain includes pavement, open field, sand, sand dunes, water (they must float), and mud. What is the Killer Tomato? In the winter of '95 my wife was 10,000 miles away in Antarctica. I had been dreaming of a kinetic sculpture vehicle since observing them the past couple of summers at the local da Vinci Days celebration. With no supervision, I was free to "play." On one of those long dark nights, inspiration hit. I had been walking across campus earlier in the day and saw folks doing wheel chair wheelies. Dynamic balancing would never ever work for a KSV but if the wheels were bigger and one was suspended below the axle you would have static balance. I started dreaming of big wheels. I also started trying to figure out a drive mechanism. One couldnt hand power it like a wheelchair since using arms is too inefficient. Instead, one would have to use leg power. Bike parts (for gear changes, etc.) also seemed a necessity. Granted, I could have steered by braking one wheel or driving each wheel independently like a wheel chair, but I didn't think that was very clever, nor did I think it safe. Stopping and steering at the same time & with the same controls didn't feel right. Think Differentially! Very BIG Wheels! I started thinking about differentials and after much scribbling on paper, I figured out that numerous configurations of two differentials seemed to allow the driving & steering of a two-wheeled vehicle. I then bought two, small model car differentials and assembled them in one of the configurations and it worked! A friend then successfully modeled it with Lego pieces and electric motors. For wheels I learned that irrigation wheels are manufactured up to 10 feet in diameter. I thought that bigger was better but my garage ceiling is only 9 feet so I chose 8 foot wheels. Mind you, I still had a problem with 8 foot wheels because the garage door is only 7 feet high. True, while I could work on it inside, I first had to disassemble the vehicle to get it through the door. I also started looking for the mechanical parts. I couldn't find small, cheap differentials but figured out that modifying bicycle internal 3-speed hubs could form a planet and sun gear arrangement. This is equivalent to a differential andcheap. I modified two of them and built a working model using bike wheels and powered by cordless drills tethered to a controller. This proved that the mechanical design worked. All I needed to do was make it bigger and pedal powered. That proved the greatest challenge, as building the frame wasn't easy. Where the Metal Hits the Probe. I didn't know how to weld so the frame for the real vehicle was built using threaded 1.25 water pipe and muffler clamps to hold pieces together. The few pieces needed for bearing mounts were brazed out of steel angle, but my skills were sorely lacking. This brazing was ultimately one of the points of failure. Adding pedals, derailleur, seat and the 3-speeds and steering, finally came together but only hours before the race. Test Drive? What Test Drive? At the start of the race, it had been ridden a few dozen yards total and was constantly needing tightening or alignment. 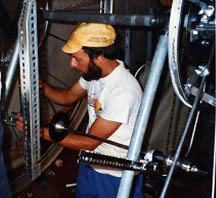 Every chain tension change caused a couple of other chains to go out of adjustment, so it was nearly impossible to get it to work and keep it working. Tires had been fashioned from mountain bike tires with the bead removed and opened up and screwed onto the irrigation rims. They were very loose and irregular but were slightly better than steel on concrete. The brakes were just barely able to stop it and it wiggled and shook all over. 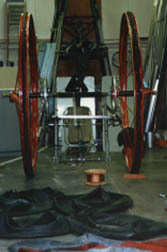 The scheme for flotation had been to use giant truck inner tubes attached to each wheel. Late Friday afternoon (the day the race started) as we were test inflating them, one of them blew up. It was too late to get a replacement so that night we spent a lot of time trying to figure out how to attach anything else that would float the vehicle. This included numerous smaller inner tubes, plastic buckets, and foam ice chests. None of these wanted to stay in place when we tried to attach them. We pretended to have flotation along, by strapping what inner tubes we had onto the vehicle and heading to the check in. I didn't signed up for the race until the very last minute because I still wasnt sure whether it would actually be mobile under its own power in time for the race. Friday evening riding it down to the check in more than tripled the distance it had ever been ridden. It actually survived that trip and the trip back to the shop afterwards.We continued to try to rig flotationto no avail. The next morning we made it to the check in for a second time. It passed the brake and safety check and then completed the parade. Next, came the race. The vehicle started the race and made it through the first segment of pavement. When it first encountered broken terrain, one of the internal axles in the 3-speeds broke and we were out for the rest of the day. We pushed it back to the shop and tore it apart and replaced the broken part. We spent more time trying to figure out how to provide flotation, but finally decided that completing the various segments of the race was impossible. Since the likelihood that the machine would break during the mud section was apparent, there was no reason to worry about floating on water. We retired for the night to get some much needed sleep. Day Two of the Race. The following day, I rode it to the mud pit site. The only way to move it, was to ride it. Again, this ride more than doubled the distance that it had ever been ridden. The Killer Tomato succeeded in getting into the mud under its own power, but as soon as the momentum was gone, the forces in trying to pedal it through were too great. First, a chain popped off but was readily replaced without getting off the vehicle. Upon starting up again one of the brazed bearing brackets suffered catastrophic failure and I had to be pushed out of the mud. The broken part was irreparable, so we had to watch (rather than race) the remainder of the race. Pushing the broken Killer Tomato back home was not an option. Instead, the wheels were removed and the machine was hauled home in three trips (one for the frame and one each for the wheels) in my small pickup. 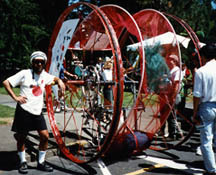 For the maiden race of Killer Tomato (da Vinci Days, 1996) the vehicle had no floatation and almost no art. However, I had completed the check-ins, the parade, and had actually ridden it on the road. I received lots of encouragement from the other racers, and also learned where to get more suitable, small differentials that would become the start of the rebuild for 1997. The encouragement of the racers insured my continued participation by bestowing on me a racers choice award. I was hooked. da Vinci days was the only KSR race that I knew anything about when I first entered the race. Being in the race I learned about other opportunities to show off. We have friends in the Port Townsend area so we decided to visit and observe that race. What an eye opener! I'm certainly glad that I went to observe before actually racing. The Port Townsend Race is a da Vinci race all crammed into one day with far more zanniness than Corvallis. I liked it a lot and was again inspired to rebuild the Tomato. I started planning during the off-season by acquiring parts that would be durable enough for a vehicle weighing close to 500 lbs. I also decided to learn to weld (MIG then TIG). Naturally, I needed to purchase high quality CrMo tubing for the frame. Everything except the wheels was redesigned, rebuilt and replaced. 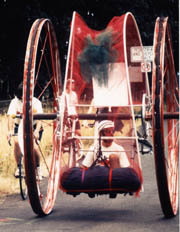 The wheels were given solid foam "donuts" to provide floatation. With a full year to rebuild, it was once again down to the wire trying to get it completed. Anything else just wouldn't be Kinetic!